At the heart of the Toyota Way are two pillars, Continuous Improvement and Respect for People. 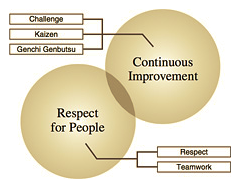 These are supported by five values, Challenge, Improvement, Genchi Genbutsu, Respect and Teamwork. The word “challenge” means either a thing, in the single form of challenges, such as competition or obstacles to overcome, or the action to engage in a contest, an adventure or experiment at which may succeed or fail. It seems clear enough that kaizen, genchi genbutsu, respect and teamwork are intended as principles to turn into action, but the meaning and intent of challenge is more ambiguous. Here is an image of the Toyota Way pillars and foundation from the Toyota website. When we are faced with challenges, too many times it is not by choice. Neither is it clear whether these conditions are actual challenges (as in surmountable obstacles) rather than muri (deathblows) that we are faced with. We do not want to pursue great dangers (challenges) when we should merely be striving (challenging) to improve ourselves. If we are to learn from and put the Toyota Way into practice, it would seem that making this distinction is critical. Toyota believes that an effective workplace is one that allows people of different ages, genders, ethnic groups and cultural backgrounds to work together as a team. We believe in challenges and the importance of decisions based on personal investigation, efficient fact-finding and in-depth analysis. Working at Toyota is also an exercise in long-term thinking. “We believe in challenges”, what does this mean? One cannot believe in challenges in the same way that we believe in ghosts or do not believe in ghosts. Challenges are unquestionably real, however subjective. Does it mean “we believe in facing challenges rather than running away” or “we believe in giving ourselves challenges where none exist”? The latter seems most likely, based on the “no problem is a problem” mentality at Toyota and the notion of constant dissatisfaction with the status quo. This is a bit more helpful and addresses the change element of continuous improvement through questioning the current standards, paradigms, knowledge, best practices and so forth. This is the active form of challenging. However, “embracing challenges” means being responsive or reactive to crises that come our way, whether we welcome them or not. On yet another common explanation of the Toyota Way, challenge is explained in a different context that is both proactive (vision-setting) and reactive (meeting emergent challenges). While this is thematically consistent with challenge as an aspirational thing, striving to realize one’s dreams, etc. the wording is emphasizes reacting to challenges rather than challenging our own internal conditions. Both forms of challenge(s) are necessary but quite different things, requiring different behaviors, leadership and tactics. Along the same lines, on the Toyota Global website there is an entire index page dedicated to “Challenges” faced and overcome during their history. This is challenge in the reactive sense. At Toyota, we’re always challenging ourselves, looking at how we can improve what we do, and thinking up new ideas that will make customers’ lives that little bit better. This example is more inward-looking and proactive. This is the broadest and generic copy it is perhaps the best explanation and benefits from a clearly stated purpose of improving the lives of customers. What is a practitioner of kaizen, lean or operational excellence to do? What is the standard to follow or strive for in regards to the building block of challenge? As an aid to putting challenge into practice it may be useful to consider what it is not, or should not be. This will allow practitioners to explore the application of challenge from within the safety of guide rails. This especially important because “proactive challenge” is internal, controlled and reasonable while “reactive challenge” may be external, is uncontrollable and may be unreasonable or unresolvable. We need to avoid confusing feats of foolishness with feats of strength when practicing challenge. How is it possible to know the set of obstacles belonging to a challenge set before us are surmountable? First, a teacher challenges the student to do something that the student does not yet know they can do, but that the teacher knows they can do. This is the most basic rule of challenge: be guided. Second, when we challenge ourselves we are looking for improvements to current methods, better outcomes. We are not looking for miracles. The successful result of challenge should be imaginable, even if not clearly visible. Finally, challenge must be physically possible, according to reason. This may seem obvious but in truth the higher up one goes in an organization and the more distance and time is put between leaders and the gemba, the fainter reason becomes in the minds of these leaders. Muri saps the attention and energy to a degree where we are forced to cut corners, reduce attention to detail, repeat mistakes and fail to learn. Overburden may be the quantity of work, the type of work and also the way or working between people, such as a culture of hiding problems or assigning blame. These things are unreasonable and do not challenge people in a positive way. In order to grow, people need to be challenged intellectually, requiring us to expose our ignorance (lack of knowledge or ability) so that we can fill it either by personal learning or by forming a team to borrow these skills from others. There is a Japanese expression 無理が通れば道理引っ込む (muri ga toureba douri hikkomu) which means that when we begin accepting behaviors that are unreasonable, immoral or wrong eventually reason, logic and correct behaviors fade away and the unreasonable becomes the norm. A similar English phrase is “When might is master, justice is servant.” There is a fine line between muri and challenge, one that Toyota has been accused of crossing more than once in its labor practices, supplier management, and vehicle sales plans. Even Toyota can confuse challenge with muri. A task may that may be an unreasonable burden or even impossible for an individual may merely be a challenge for a team. Perhaps this is the magic that makes the Toyota Way work (Teamwork, Respect) despite the vague and divergent notion of challenge. Challenging Challenge. It is ironic that this notion of challenge has not been challenged to a greater degree. There is more of ambiguity here than would seem to be acceptable for such a high profile element of the culture at Toyota. Following the Muri Mura Strategy	The First Emperor of China Followed the Toyota Way?